In Has Anyone Seen My Fanny? the authors, in the roles of their alter egos Glockneeb and Moose, are the main characters in a zany storyline in which they compete for the limelight writing alternating chapters. After receiving a letter from his sweetheart Fanny Tushbottom raising concern that she is missing. Glockneeb reluctantly seeks help finding her by reconnecting with his life-long friend Moose who had started his own private investigation agency. They become partners at the agency and undertake other cases, wreaking havoc on everyone that has the misfortune of coming into contact with them. Glockneeb comes across as a big picture guy, brainy, yet whiny, while Moose is the brawn, clumsy, “act before you think” guy. The story is filled with humorous nonsense dusted with machismo, sexual innuendo and the warmth of a damp washcloth. 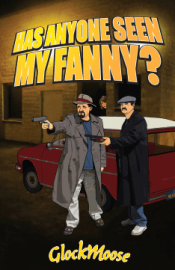 Title: Has Anyone Seen My Fanny?